Direct- and indirect-fired ovens have different strengths for baking. What is a Direct Gas Fired Oven? DGF ovens are mostly used for biscuit- and pizza-making. DGF ovens may also be used for baking all types of crackers, cookies, and biscuits. DGF and electric-fired ovens both have similar heat transfer mechanisms. Why is the distinction relevant? 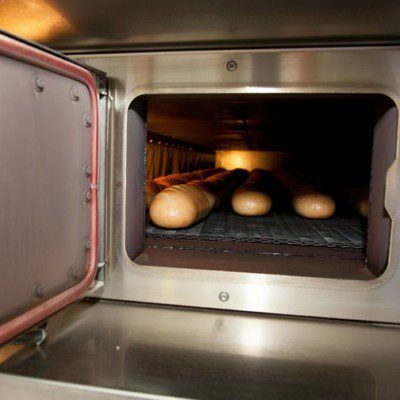 DGF ovens play a key role in the biscuit- and pizza-making industry. They are especially suitable for baking products that require high temperatures, often above 300°C (572°F) (pizza, flatbread, and other similar products). These ovens may also be used for baking all types of crackers, cookies, and biscuits. It is important to note that direct gas-fired and electric-fired ovens both have similar operation and heat transfer mechanisms. Some bakeries prefer this type of oven due to its balanced treatment of products. Each burner is supplied with a mixture of gas and air. The pressure of this mixture (flow rate of each component) determines the extent of the combustion reaction (power delivered), and hence the temperature set point of the oven. Block diagram for a DGF oven. The IGF oven makes use of the heat exchanger concept to transfer energy from burners to the products. The baking chamber is indirectly heated from above and below by the thermal radiation generated by high-temperature rows of steel tubes/ducts (exchangers). Block diagram for an IGF oven. Overhaul is necessary to prevent contamination of the food by undesirable and hazardous products of combustion, such as nitrogen oxides, carbon monoxides, and sulphur compounds. Burners and ignition points require regular servicing to maintain combustion efficiency and overall process safety. Oven heat exchangers must be maintained regularly, as dirt and condensation (in steam-heated IFOs) may collect in their interior. All piping components (gaskets, fittings, and seals) must be dismantled for cleaning purposes. Manley, D. “Biscuit Baking.” Manley’s Technology of Biscuits, Crackers and Cookies, 4th ed., Woodhead Publishing Limited, 2011, p. 490. Fellows, P.J. “Baking and Roasting.” Food Processing Technology: Principles and Practice, 4th ed., Elsevier Ltd., 2017, pp. 735–740. Davidson, I. “Oven Designs.” Biscuit Baking Technology: Processing and Engineering Manual, 2nd ed., Elsevier Inc. , 2016, pp. 80–82. Singh, R.P. “Heat Transfer in Food Processing.” Introduction to Food Engineering, 5th ed., Elsevier Inc., 2014, p. 268.